When those long journeys beckon, the first challenge is to decide on which CDs to load into the car’s auto-changer to help pass away the hours. 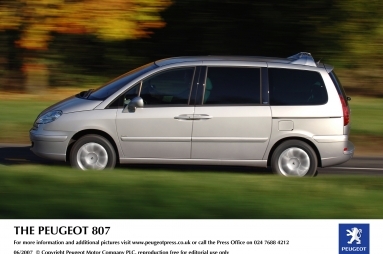 Now with the Peugeot 807 this is a thing of the past as no longer is it a choice of five or six CDs, now the driver of the 807 has over 180 hours of music to choose from. From July the innovative and versatile Peugeot 807 will be available with Peugeot’s innovative RT4 Multi Media system. This new system incorporates colour satellite navigation with full European mapping (so no need to change CDs or memory cards either), hands-free GSM mobile phone and a tri-tuner radio combined with a 30 GB hard drive offering a novel “Juke-Box” function, which allows up to 180 hours of music to be downloaded and stored in MP3 format. So if it’s Coldplay or Bach, choosing the right CD is a thing of the past. Now the challenge is to find a journey to enjoy all of your music, a challenge made easier with the 807’s potential range of over 600 miles between fill-ups. Advance technology normally comes at a price but not with the RT4 Multi Media system, which has an option price of £1,650 inc VAT. To obtain high resolution downloadable images and pricing and specification information please log onto the Peugeot press website: www.peugeotpress.co.uk (Newspress passwords apply).